I just registered. (Was Nick, now nicksen782.) I am using a 5V Arduino. I am using a total of five resistors with one each on each wire to the PS2 remote except for the ground wire. I spent some time using trial and error to determine resistor values. I also tried 15K resistors on the ATT and CLK lines but I would get erratic responses from the Arduino program. I don’t really think that a resistor is needed on the DAT line as it is only one-direction and comes from the controller. I could never get a reading much over a few mV on that resistor. Everything works. Added version 0.2. Download link in original blog post above. New Example Sketch has example of all the new functions, and explains what they do. Pressures and Rumble coming soon. If you are able to read when any button is released? Yes, download the example file and it goes over a function that returns TRUE when a button is released. This is some great stuff! I am trying to use this library using a wired controller, but cant seem to get my arduino to read anything. Can you help me with a hard wired example of what goes where? I’m on travel for work, so it will be a while before I can properly document the wiring. Are you using an official Sony controller, or a third party knock off? Do you have the right board selected in your arduino IDE? Whenever you get a chance is fine, I understand completely! I am using the official Sony wired controller, with the correct board selected in the IDE. One controller makes the serial monitor go crazy without me pressing anything, the other controller does nothing regardless of what I press. I’ve added a new version that has some error reporting, and might increase compatibility with some controllers. Try it and let me know if it works / what it says. use the picture in the post if the colors don’t match up. Thanks a lot, I will try it soon and let you know the results! I have a standard Sony Dualshock 2 controller and a 5v Arduino…everything appears to be working and I’m getting data from the controller…but the analog sticks keep giving back weird feedback. It seems like the number will cycle quite a few times just while moving the joystick in one direction. Have you come across this at all? I wonder if it’s an issue with the 5v signals…but you said you were using a Sony controller, right? I am using the 5V arduino. Is this from the example sketch? Hmm, Do the Analog pressures from the D Pad fluctuate the same way? Try both versions (1.0 and 1.2) and see if they both do it. Remember you have to replace the files in the libraries folder and restart the Arduino IDE. You can also try the resistor values here to drop the voltage down. “I am using a 5V Arduino. I am using a total of five resistors with one each on each wire to the PS2 remote except for the ground wire. I spent some time using trial and error to determine resistor values. 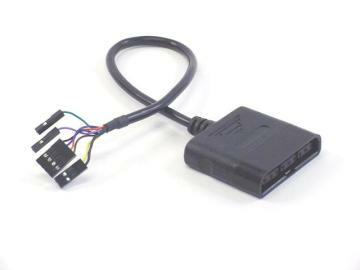 Hey I have a Arduino Duemilanova 128, Sony Analogue SCPH-10010 A connected to a cable extender I cut off because I didn’t want to cut the end off the controller. I have to assume the pinout on the cable extender matches the pinout on the controller. I have the following wire colors(red,black,blue,yellow,green,orange,grey, brown). The only wires not used are the grey and green. I have loaded the latest sketch to the arduino but it still gives me the message “No controller connected” in serial monitor window. Any ideas? Well Bob, you are using the exact same controller as mine, so you shouldn’t be getting issues. You can verify the wire colors by using an ohm meter with the cut off end of the extension cord. 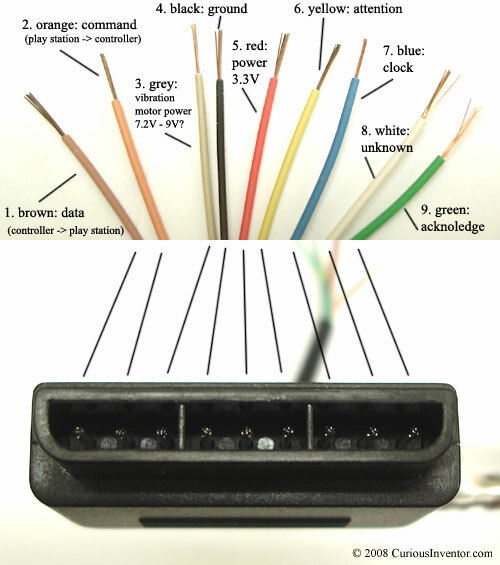 Verify continuity between the correct wire color and the correct pin on the connect as listed in the diagram in my post. Is the Duemilanova 5V or 3.3V? Maybe try using resistors to drop down the voltage if it’s 5V. The last comment before yours has the resistor values one guy found would work. make sure you have the right board selected in your Arduino IDE. If the wrong board is selected the clock will be different and may not work. How are you powering the controller? Does the red light come on, if you press the analog button does the red light come on (or go off)? I have just check the wires on the extender with the multimeter and they match both color and location as per the image above. The board is 5 Volt operating voltage. I have resistors setup and checked the voltage which was between 3.3 and 4.3 volts. The Arduino Alpha IDE is version 0018 which only gave me one option for the Duemilenova, correct com port is selected as well as baud rate set at 57600. The controller is powered by the Arduino and when I push the analog button it does turn red. I’m new to this so I am kinda at a loss for ideas now.